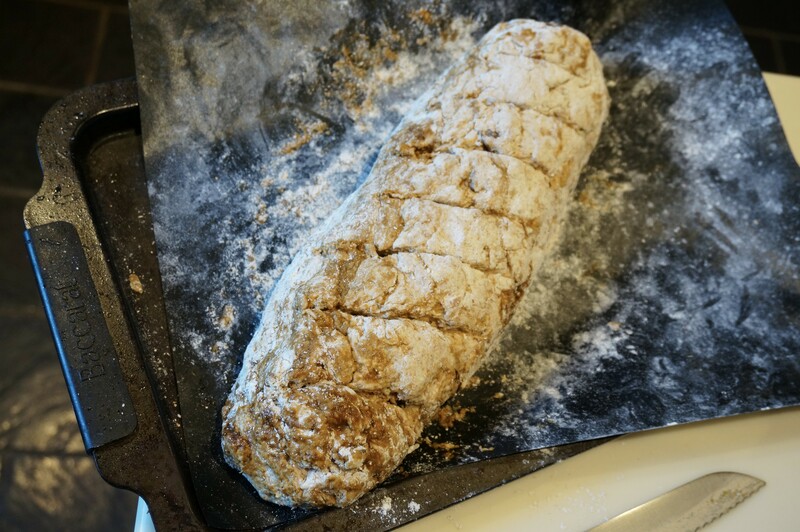 Soda bread seriously is the easy bread in the world – no kneading, proving or hours of goddamn waiting for your delicious loaf of steaming fresh bread! I reckon you could be go to woah in 50 minutes, including a little cooling time. Or less if you’re a bit smarter than me and make 2 smaller loaves rather than one gargantuan one! It’s much like a scone dough so in fact the more gentle you are, the better it will turn out. For the same reason, spelt is an excellent flour to use to make it. The dough will seem VERY wet and soft compared with yeasted bread dough but this just goes to give a soft, moist crumb. I find the best way to shape it is to use a teflon baking sheet to rock it back and forth into it into a log. All this bread needs is a little butter and some peace and quiet. I think it would also be great made into crisp breads for a cheese board. The raisins and black treacle (molasses) give a little warmth of caramel flavour which is punctuated with crisp nuggets of walnuts. Very more-ish. Dunno how I stopped at 2 slices for breakfast.